Super Nintendo SNES ✨Oscar ++ Steel Talons ++ Sim City 2000✨ USA Authentic NICE! AUTHENTIC ~ Sim City 2000 (Super Nintendo, 1995) SNES ~ TESTED & WORKS! 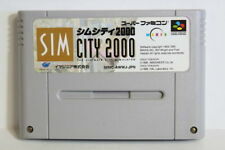 5 product ratings - AUTHENTIC ~ Sim City 2000 (Super Nintendo, 1995) SNES ~ TESTED & WORKS! Trending at $8.49Trending price is based on prices over last 90 days. Sim City Simcity Super Nintendo SNES Original Authentic Video Game! 23 product ratings - Sim City Simcity Super Nintendo SNES Original Authentic Video Game! SimCity (SNES, 1991) Players Choice. Very Good Condition. Complete! 23 product ratings - SimCity (SNES, 1991) Players Choice. Very Good Condition. Complete! SimCity (Super Nintendo Entertainment System 1991) SNES w/ Box Sim City Tested! 23 product ratings - SimCity (Super Nintendo Entertainment System 1991) SNES w/ Box Sim City Tested! This page was last updated: 19-Apr 20:34. Number of bids and bid amounts may be slightly out of date. See each listing for international shipping options and costs.